Four refined concepts (above) have been released for the Metro project that will build a fast, high-capacity transit line between the San Fernando Valley and the Westside through the Sepulveda Pass. Three of the four are heavy rail — i.e. the type of trains used on Metro’s Red/Purple Line subway — and the other concept is a monorail. 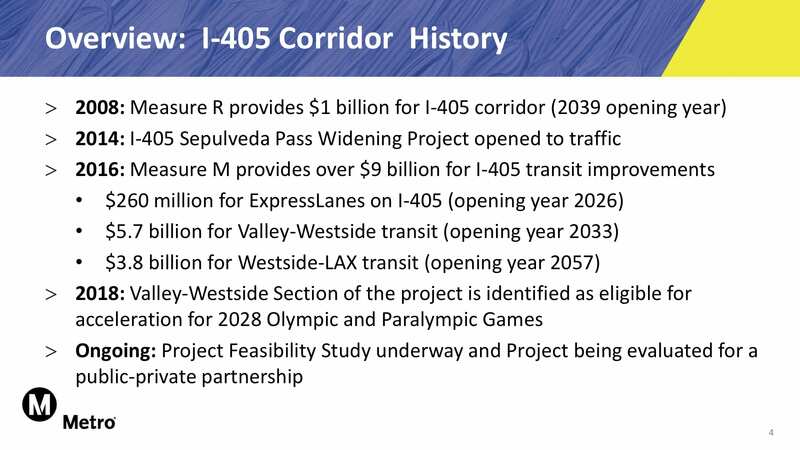 The refined concepts are part of an ongoing Feasibility Study for the Sepulveda Transit Corridor project, which has nearly $10 billion in overall funding from Metro’s Measure R and M sales tax measures and other sources. Here is a new presentation; many of the slides are included in this post. Before diving into the concepts, I think there are two slides worth mulling as both show the importance and benefits of the project. The first shows that this line is being designed to be fast — faster than driving the 405 over the Sepulveda Pass much of the time. The second slide shows the estimated ridership of each concept. To put the numbers in perspective, the Red/Purple Line is currently Metro’s busiest rail line and averages about 138,000 boardings per weekday. •Metro has a separate Measure R and M project that will build a light rail line between the Orange Line’s Van Nuys Station and the Sylmar/San Fernando Metrolink Station via Van Nuys Boulevard and San Fernando Road. 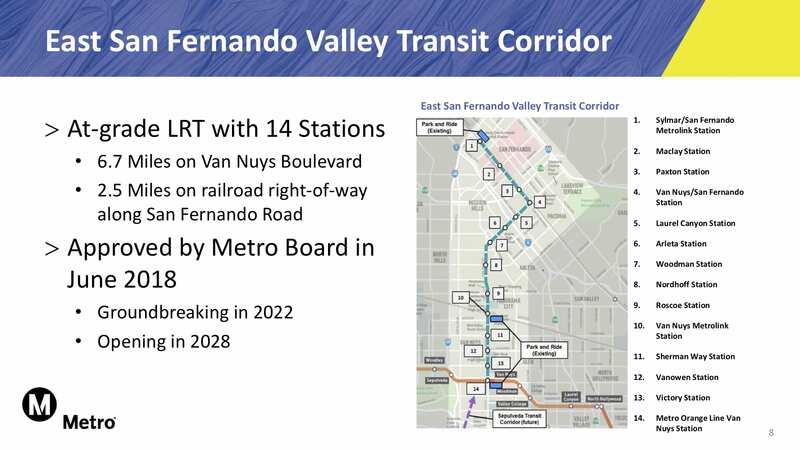 That project is named the East San Fernando Valley Transit Corridor and has already been approved by the agency’s Board of Directors and is due to begin construction in 2022. 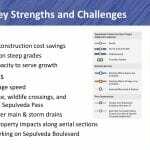 •A planning challenge for the Sepulveda Project has been figuring out whether it’s best to extend the Van Nuys light rail line to the Westside to allow a one-seat ride or use a different type of train and build a good, easy transfer between the two lines. 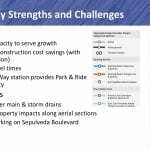 •Metro staff determined that light rail doesn’t offer as much future capacity for the Sepulveda Line as heavy rail or monorail. Why? Light rail has shorter trains and smaller rail cars. Therefore, staff are proposing to eliminate that concept from further study. •Modeling by Metro shows that the Sepulveda rail project would also greatly increase ridership on the Van Nuys-to-Sylmar/San Fernando light rail line because it provides a reliable way for passengers to reach the Sepulveda line. •Ridership, in fact, would exceed capacity on the southern part of that light rail line, the reason that the remaining four concepts for the Sepulveda project go to the Van Nuys Metrolink Station. The idea is to intercept the ridership demand on the Van Nuys line before light rail trains get too crowded. •Metro is working with UCLA to find a station location for the Sepulveda line on campus. On the above maps, that station is represented by the dot near Sunset Boulevard. That dot will likely move. •The refined concepts have a transfer between the Sepulveda line and the Purple Line at Wilshire/Westwood Station — which ridership modeling showed is the best place for the transfer point. 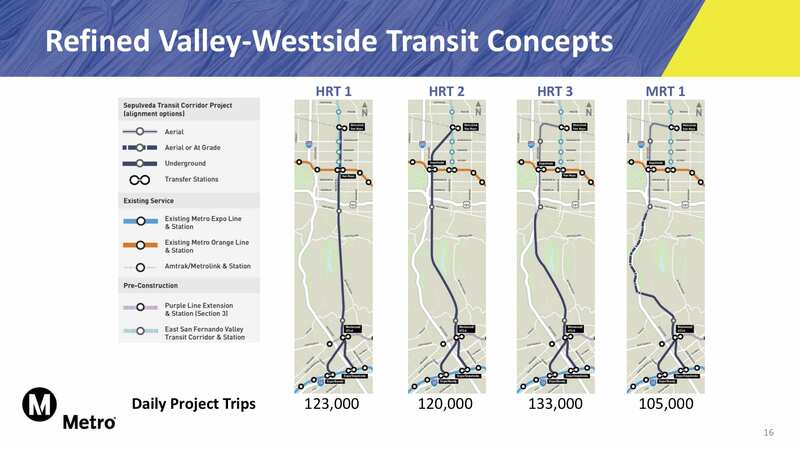 •An earlier concept from last June that would have extended the Purple Line from the Westwood/VA Station to the San Fernando Valley was dropped due to lower ridership. The problem: such an extension veers too far west and, thus, would have missed an on-campus UCLA station. •Metro is still working on whether the first segment of the Sepulveda Project would terminate at the Expo Line’s Bundy or Sepulveda stations. There would be no station on the Sepulveda Line between the Purple Line and Expo Line because modeling showed low ridership potential. 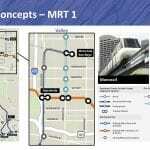 •Metro is seeking to build the Sepulveda Project in time for the 2028 Olympics and Paralympics. That will require accelerating the current funding and building a very big and very complicated project at a very rapid pace. •Under Measure M, the second phase of the Sepulveda project between the Expo Line and LAX is not due to break ground until 2048. Still, Metro is studying initial concepts for that segment to ensure that the first phase is built in such a way that it can continue south. Click on each slide below to see a larger version. 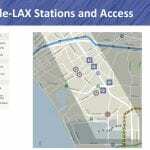 •All concepts for the LAX segment propose to terminate at the Aviation/96th Street Station that Metro will soon build near LAX. That station will serve trains along the Crenshaw/LAX Line and Green Line and will be the transfer point to the LAX people mover that will take passengers to the airport terminals. •Finally, this slide explains where we are in the Feasibility Study process. 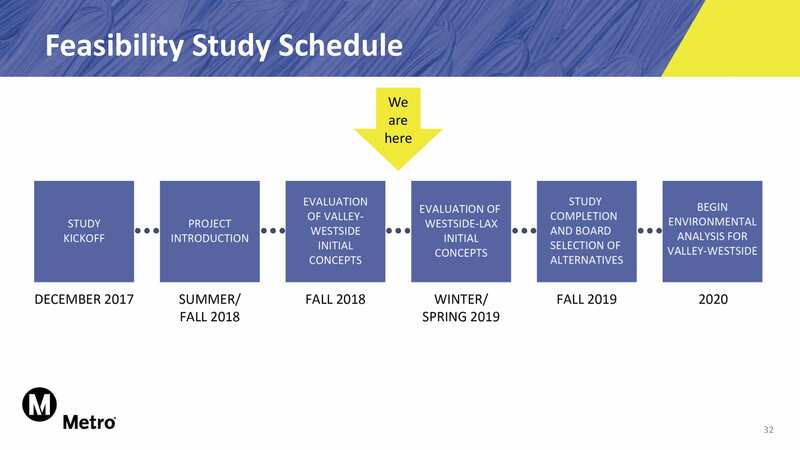 The Metro Board will review the alternatives identified in this study and decide which advance to the project’s formal environmental studies. Metro hopes to begin the environmental studies in early 2020. What do you think of the refined concepts, readers and future riders? Comment please. Wednesday, January 30, 6 – 8 p.m.
Saturday, February 2, 10 a.m. – 12 p.m.
Tuesday, February 5, 6 – 8 p.m.
A presentation will be given at 10:30 a.m. for the Saturday meeting and 6:30 p.m. for the evening meetings. All Metro meetings are held in ADA accessible facilities. Spanish translation provided. Other ADA accommodations and translations are available by calling 323.486.3876 or California Relay Service at 711 at least 72 hours in advance. Can the future Aviation/96th street station be modified to have the station box pre-built to accommodate this line? Great concept and I hope to see it in my lifetime. Really doubt this will be up and running by 2028. Lets hope Metro proves me wrong. I’ll vote for Bundy as the terminus instead of Sepulveda. Reaching west of the 405 will have a much more positive effect on ridership and the Bundy Station is busier than the Sepulveda Station today. The Monorails should be considered the least feasible and eliminated early. There’s no point of monorails. They have to fund an entirely new train technology with no commonality. If they are trying so hard to finish in time for the Olympics in 2028, wouldn’t it be better to do the LAX to Purple Line connector first. Then complete the northern line later. Metrolink needs to be converted to Metro style trains, payment, and service frequency. Metrolink is actually the weak link. Also, looking closer at the Monorail proposal, the only reason to build that would have been to include the Getty Center as a stop. Since that no longer appears to be under consideration, there’s no point in building a Monorail over a Subway. I noticed in the slides above that the monorail option appears to only be considering what we normally think of as a monorail (single center track with train on top), but has Metro considered a suspended monorail system, similar to what they have used to great effect in Japan? In Yokohama, the Shonan monorail had to overcome a similar grade as the Sepulveda Pass, and it seems to me like the suspended monorail system wouldn’t have the same problems listed for a normal monorail (difficulty managing nature/stream crossings). It would also probably work better for the underground portion, as monorails generally have trouble with tunnels, but suspended monorails not as much. This is what I was thinking as it is more feasible and probably faster than the old monorail. I think the big issue for this solution will be everyone’s concern over earthquakes and the problem with suspended anything coming down in a big quake. The light rails are not the answer as there just is not anymore room on the land in the Sepulveda pass to place a track. The suspended monorail only needs posts every 100 or so feet. We need to start thinking up rather than out as we are running out of “out”. Subways are too expensive and the tunneling takes forever. The suspended monorails could be up fairly quickly. Need to get Elon Musk into the mix too. His hyperloop concept should be seriously considered too. 15 minutes from Van Nuys to Sepulveda/Expo, no need for hyperloop here. How about, instead of heading toward UCLA, this line heads toward San Vicente Blvd, and be a part of the northern expansion of the Crenshaw Line; which will, by necessity of this choice, itself choose the San Vicente Blvd route option. Then you have a one-seat ride from Torrance to Van Nuys, with direct stops at the airport, West Adams, busy but-freeway-far Westside places, and West Hollywood; and crosses the Expo, Green and Purple line. You’d have to go light rail to match Crenshaw’s current design, but the idea of linking together most of the central LA areas heavy with places people want to go could be really appealing. Disappointed that the light rail option is off the table to allow continuous operation from Sylmar to the Westside, however I trust that Metro’s experts studied the potential for the Sepulveda Pass and HRT or even monorail is the best way forward. It’s good that Van Nuys Boulevard will be a light rail line connecting to the future Sepulveda Pass subway. Some of the alternatives calls for the Van Nuys LRT & Sepulveda HRT/MRT shared at the Metrolink station & Orange Line station; it looks like these areas may become the next “North Hollywood transit hub”. Seeing that the updated alternatives take LRT out of the equation, and with no tie-in to the Purple Line, I’d wonder where the maintenance facility & storage yard for this project will be; the Van Nuys LRT is slated to have a yard near the Metrolink station, but is there room to accommodate for a different rail technology? There could still be a non revenue connector track much like whats on the blue to green line junction at Willowbrook. This would be the wise way to go so as to easily move train cars around, as a matter of fact, it would be extremely unwise not to do so as not having such a connector would mean metro would have two separate isolated HRT networks for no good reason. I’d rather see them scrap the east valley project, funnel the funds into this project and have a 1 seat HRT ride from Sylmar to LAX via Van Nuys Blvd. merging the two projects would allow for more funds, allowing it to be accelerate, possibly even to LAX by 2028? and built right instead of having 2 competing services in one area. 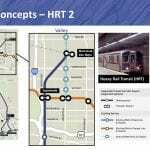 HRT all the way to Sylmar Metrolink would be cool, but would be really prohibitively expensive. The two lines serve very different functions. (A highly connective route through the valley and a quick trip through the pass) Combining the two would undermine both purposes. These are decent options. I definitely think that primarily running down Sepulveda is better from a point of view of hitting major destinations / job centers and not doubling up on the LRT’s line. However, this isn’t great for anyone traveling on Van Nuys South of the Metrolink stop (essentially half the Valley), which creates an odd situation where travel times to the Westside are likely going to be shorter North of the train station than South of the train station (at least for a bit). I think HRT-3 makes the most sense *if* the Van Nuys LRT is reopened to continue down Van Nuys / Ventura to the Sepulveda/Ventura station (even if this happens at a later point – and even more so if some easy interchange with the Pass line is prepared – using an underground cross-platform interchange, for example). Elevated on Sepulveda definitely makes sense, especially if it allows an extra station to be built. Thankfully, modern elevated tracks aren’t the ridiculously loud and leaky steel girder messes of the early 20th century anymore. On the south end, good to see a UCLA station on north side of campus- Sunset Blvd is still best as you can also have transfers to both Rapid and Local buses east /west on Sunset. You could also have any UCLA shuttles connect here as well. Still make the Purple Connection at Westwood Blvd, Expo at Sepulveda and have the line continue down Sepulveda , Culver City, Fox Hills area to LAX as on the 405 option. Maybe consider a stop at the LAX intermodal/remote check in stop first to allow transfers 1 stop closer to LAX, because I feel if you dump ALL the connecting passengers at 96th, you may overload that facility. That facility is going to have 3 light rail lines and all the city buses I believe. The connections at Westwood for the Purple and Sepulveda for Expo create “4 way” directional transfers (N/S/E/W)- best bang for the buck. The other option of Purple extending down Centinela is interesting, but I then would say just extent it past the VA down Wilshire to downtown Santa Monica and then just turn it down Lincoln to LAX instead. Adding this to the Sepulveda Line down to LAX would give roughly 2 north/south lines on the crowded westside. Couldn’t hurt. I respectfully disagree with the UCLA station opinion. This station has to be south of the campus on Strathmore Pl. or Charles E. Young. Preferably, the station in between both streets with an exit tunnel on the north for passengers to the campus and Pauley Pavilion and the south to Ronald Reagan Hospital and the northern part of Westwood Village. A station at Sunset would leave passengers at an area of the campus near parking lots and sports fields. I understand the idea of the buses but with the Purple and Sepulveda fully built I don’t see high ridership on those buses. While subway type trains are the chosen type of equipment why do they have to be underground for the part of the route along the 405? Building above ground is less expensive and can be achieved in less time. In fact Supulvada is a very wide street and the trains could run elevated or below ground but not covered for far less money along that portion as well. The underground route between the valley and Westside does not follow the 405. To go above ground in this section, Sepulveda (north of Mullholland) is residential, so that has to be avoided. HRT 1 is obviously going to win this contest. Would there be any way to segment off and accelerate funding to build a shallow cut and cover box structure and utility relocaiton project (it’s a really wide blvd, it wouldn’t need to be sidewalk to sidewalk, just center of the street excavation) for the overlapping section with the ESFV before the ESFV begins work on that section? This would allow for the two subway stations to be shallow, without gigantic full mezzanines for the those stops, which would also increase transfer speeds from metrolink and the top of the box structure could be restored to be ready for the construction for the ESFV. This would mitigate the neighborhood impacts over the long run. I know cut and cover has a bad reputation, but it would allow for shallower stations and greatly reduced construction impacts for this neighborhood ultimately. The rest could be TBM bored tunnels. Since it is likely going to cross Westwood at parking lot 36 and proceed down veteran to expo ( not cruciform under the askew and skyscrapered westwood intersection). As for the LAX portion, I’m hugely delighted to see a purple line extension under consideration! first, have the bundy option selected for the sepulveda/LAX line, then do a “regional connector” extension project for the purple line that extends the purple line from the VA to expo/bundy. The purple line would then join up with and interline with the Sepulveda/LAX line, allowing for 2 minute headways on the section from bundy to LAX. Big mistake not including a stop between Purple and Expo Lines. Yes, I’d like to see the studies that show low ridership. West of the 405 needs viable traffic relief. The VA Hospital station will only serve the VA, as it is too far from residential neighborhoods. The Purple Line extension proposal should have a stop at either Barrington or Bundy. For a viable alternative to cars, service west of the 405 needs to be enhanced. Should definitely be the Bundy/Centinella option otherwise you are in no man’s land in the 405 fumes. Also should have a stop at Santa Monica/Bundy. Please drop the 405 southern alignment. We’ve seen the damage pollution does to people so let’s not concentrate public transit and the accompanying density near those fumes. Because more than likely (like 99% likely) this will be entirely underground, so I don’t believe pollution will be a huge issue here. Though I will admit, the trains will need to divert onto Sepulveda for the stops between Westwood and LAX. I’m more worried about the apartment buildings that follow the building of a rail line. If rail goes down Sepulveda, those apartment buildings are going to be inhaling the fumes of the 405. 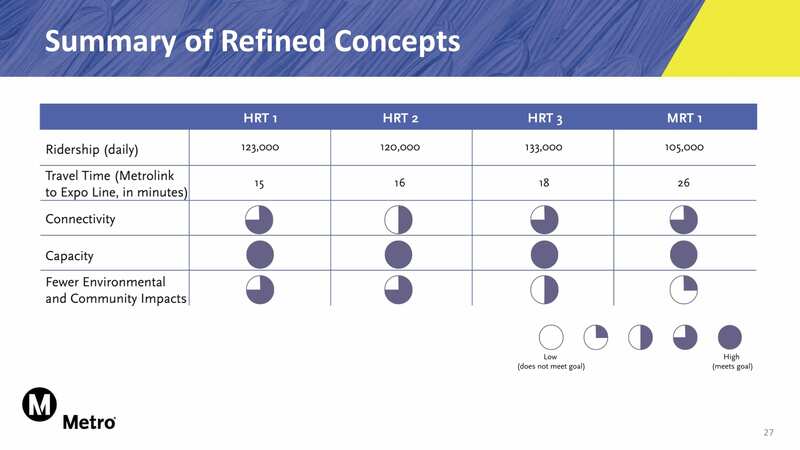 HRT 1 is the most straight-forward, go with that. I would add a stop on Santa Monica Blvd. (either at Sepulveda or Bundy, but Sepulveda is my preference) That section of West LA is severely under-served by transit and grid-locked every day. It’ll add a minute or two to the travel time but well worth it, in my opinion. I agree that the light rail segment from Sylmar to Van Nuys be scrapped and the HRT 1 Sepulveda line be extended. This would allow for a one seat option to West LA or LAX by people coming in from the Antelope Valley. 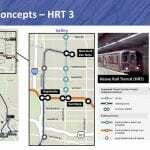 I would continue the Valley HRT to LAX rather than continuing the Purple line there. I would also think about a station either near the Getty or at Mulholland to allow access to the Skirball museum, the American Jewish University, and the other schools and churches at Mulholland and Sepulveda. Measure M doesn’t legally allow the East SFV project to be scrapped. It’s gotta be either HRT 1 or HRT 3. HRT 3 is preferable over HRT 2 since the elevated alignment can more easily and cheaply accommodate future infill stations as well as having an additional station at Sherman Way from the outset but with only a slight hit on travel time (2 minutes). 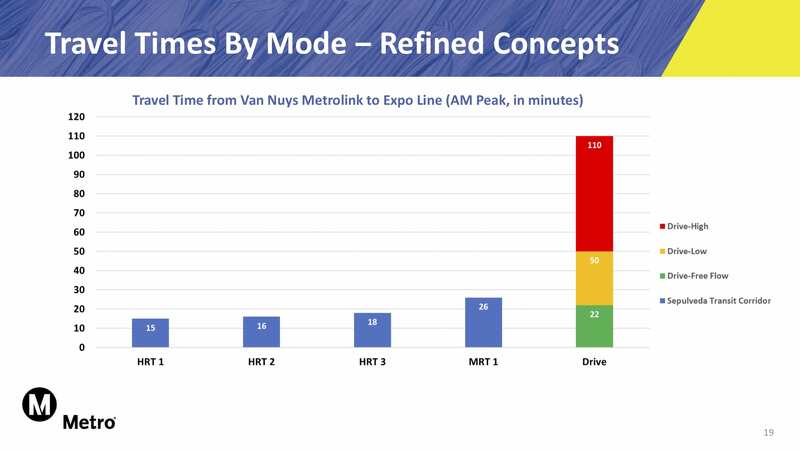 HRT 1 is great since it essentially creates a local / express type setup along Van Nuys where it overlaps with LRT and is obviously the fastest option by a small margin and is most efficient for transfers. The lack of elevated segments on HRT 1 though might make it tough to add future possible infill stations. Monorail is the least desirable here for obvious reasons. Even if newer monorail tech can reach the same top speeds of 70 mph, the fact that this would introduce an additional and isolated transit tech in metro’s network is not helpful and the steep grades and curves through the pass make it the slowest option on top of that. Lets just stick to HRT please, the higher upfront expense is absolutely justified here as this will be the main north / south line in western LA county. Additionally, non-revenue connector tracks to the purple line are a must, otherwise we’ll end up with two isolated HRT lines with no way to efficiently move equipment between them. It would be very unwise for Metro not to include this in the final design. As far as phase 2 to LAX is concerned, Centinela makes the most sense as it provides west LA closer access to this line as well as the possibility of a direct purple line to expo transfer. For the Sepulveda / 405 option, underground or elevated along Sepulveda vs elevated along the 405 is better as far as accessibility and user experience is concerned when waiting at stations. Regarding the two Centinela concepts, one option means having a one seat ride from DTLA to LAX and thus a two seat ride from DTLA to Santa Monica via expo, and the other means having a continuous rapid transit line from the mid valley through to LAX. It would be nice if a wye junction was still being considered (located EAST of VA Hospital instead of west of it, so as to allow for the UCLA campus station) so we could get both. I think a one seat ride between any endpoint on this configuration at 8 minute headways is still preferable than having to transfer even with only 4 minute headways and more likely to get people out of their cars. You would still have trains every 4 min. between VA and LAX, between UCLA campus and Van Nuys, and between Westwood/UCLA and Union Station. Fair enough but I think a station at say, Vanowen, and another one at Magnolia wouldn’t be so bad and would still keep stations a about a mile apart. The red line has stations about .75 miles apart in a few areas and is still pretty fast. I agree that the expo line isn’t designed well or at least doesn’t operate well due to all the street-running segments (having to stop at red lights, 35 mph max speed etc.) and other speed restrictions here and there, even in dedicated ROW, which I think are the main reasons the expo line is so slow. Those few very close stations (i.e. Farmdale being between La Brea and Crenshaw, and around USC) just seem to add a bit of salt to the wound. I meant to just say Santa Monica as the others appear to be in the plan. Why isn’t there a Mulholland stop? Who’s gonna get on and off at Mulholland? Seems like a waste of money given the benefit, not to mention that any tunnel would be FAR down, as any tunnel has already to deal with the differences in height over sealevel between Sherman Oaks and Westwood. As someone that commutes daily to the Getty, I am disappointed that none of these plans include a stop there. My growing frustration is that all buses from the expo line must first go to UCLA, which is more than adequately served (As all of these plans for Sepulveda Pass continue to do) adding unnecessary detours my commute. Between Sepulveda/Wilshire and Sepluveda/Ventura is a transit desert still with these plans. If there were something that went up Sepulveda from the Expo that served the Getty and the Skirball that would alleviate traffic. There are more that 1,000 employees and hundreds of visitors daily plus Skirball staff and visitors. There is **one**bus that serves these institutions, first winding its way through UCLA, and at least a dozen that connect UCLA to the rest of the county. (BBB 17, R12, 8, 1, 2, Culver City, 6, Rapid 6, Metro 734, 788, 302, 602, 720, 20 and campus commuters) Please consider this in your plans or consider changing the route of the 734 or 788 to include stops at these highly visited institutions. Thank you. BBB 14 used to go up Bundy all the way to the Getty, but they stopped serving the Getty years ago due to poor ridership there. You should probably look into bus ridership. I hate to say it, but building 2 extra stops that only serves 1K people tops isn’t exactly cost beneficial here. If the Getty and Skirball want to put in the money to build their stations, then hey by all means though. Very exciting. Lots of great ideas on the comment thread too. See everyone at the meeting(s) hopefully. It seems that the monorail option is the least likely because of what would be major community opposition. These things are loud and Metro will just have a bunch of really pissed off neighbors, plus the Sepulveda Pass has pesky wildfires that could cause frequent service interruptions, and these problems will get worse as Metro seeks to extend the line south of the Expo. Another thought is that I’m not sure anyone really believes the VA will be the ultimate terminus of the Purple Line. In just a few years, the Expo already under-serves Santa Monica with the trains at capacity during the commute so eventually push will come to shove and the Purple Line will have to go further west, so the big turn that brings it south toward LAX doesn’t make sense. 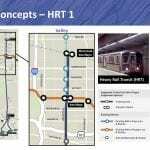 I’m in favor of the most straightforward network possible – HRT 1 that eventually means a one-seat ride from Van Nuys to LAX, and it likely also means the fastest mode that covers the most amount of distance, which makes it outcompete cars and only then can we get people out of their cars. Please consider an alternative where the Sepulveda Transit Corridor and Purple line interline between Wilshire/Westwood and Bundy/Expo via the VA. This line could continue down Centinela to LAX. This would create a one-seat ride between LAX and the valley (via Crenshaw Transit Corridor) and LAX and Downtown LA (via Purple Line). Also, you get one transfer point to the Expo Line at Bundy for both the Purple Line and the Sepulveda Transit Corridor without the unnecessary cost of building two parallel subway tunnels and two underground stations (Bundy and Sepulveda). Last, having to transfer twice from Expo to Seuplveda to Purple to get from Santa Monica to Downtown LA (as shown in H1-3 and M1) will increase travel times and hurt ridership. Again, the Purple Line should stick going to Santa Monica and that’s it, The Purple Line will not be any faster than the LAX Flyaway outside of Rush hour. It will be 15-25 min to Westwood from Koreatown alone, +15 min from a Downtown LA and the LAX Flyaway is already 10 min ahead of the Subway here outside of rush hour. Also, why would someone riding the Expo line from Santa Monica need to get to the Purple Line to Continue to Downtown LA when the Expo Line already Goes to Downtown LA? And with the regional connector one can transfer to the Gold Line once in Downtown on the same platform. Am I missing something here? Once the Purple Line gets to Santa Monica there will be absolute zero issues. All HRT concepts are great at this point and I can’t wait to ride it in the future. I would say having the new HRT rail going to LAX via Centinela Ave because it can potentially merge with the proposed Lincoln Ave BRT line into one transit project. Definitely heavy rail option 1, rather than 2, because it would be 1 station shorter for transfers from the orange line coming from the east versus the shorter commute and transfer traveling on the orange line from the west. It’s also completely underground which is better for the environment. Probably more expensive but you get what you pay for. I really don’t mind option 2. Option 3 would be cool but I doubt locals want an aerial HRT around, it would be nice though, have something like in NYC or CHI that have elevated HRT. If a Sepulveda alignment is chosen, is there any potential for the Eastside SFV corridor to be extended down Van Nuys to Ventura and then be extended down Ventura either towards Sepulveda or towards Cahuenga in Studio City? I would have to imagine this would be a massively successful extension, as it would connect the central SFV with job centers along Ventura like the Sherman Oaks Galleria and the Encino office district and provide a second point of contact along the Sepulveda line if extended westward, or with job centers like CBS Television City, Universal Studios and Studio City itself if extended eastward. This would transform the way the valley commutes and develops, with a robust transit network and increased walkability in an area that already has great bones for urbanity. I generally don’t like to predict the distant future when, yes, there’s a chance the East SFV could go south of the Orange Line. In the immediate future, the project has approved and environmentally cleared for the route between the Orange Line and the Metrolink station in Sylmar/San Fernando — and that’s the extent of the funding. So that’s very very unlikely to change. 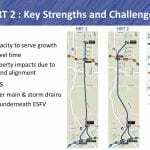 I’ve been following the East SFV Transit Corridor project since it was announced in 2011. The original proposal for the project was going to be on Van Nuys Boulevard from Foothill Boulevard to Ventura Boulevard, the project took on the initial name of “Van Nuys Boulevard Rapidway” with BRT, streetcar, & LRT as the only modes considered, as the project progressed after many public meetings, the project changed to its current name, the East San Fernando Valley Transit Corridor, the line doesn’t go to Foothill Blvd, but turns NW on San Fernando Road to meet up with the Sylmar/San Fernando Metrolink station & get the City of San Fernando to be connected to this line, and since June 2018 at-grade light rail is the chosen mode. On the southern end, the East SFV project staff met up with with resistance, from a car dealership group over concerns with surface rail, and also because the bus ridership (233 & 761 at the time, today it’s 233/744/788) had its heaviest load from Nordhoff to the Orange Line) so the project truncated at the Orange Line; the East SFV LRT will still meet the demand of the corridor. The southern segment was then transferred to the Sepulveda Pass Transit Corridor project (this project), which originally had LRT under consideration until this month, but had a better chance of making the Sherman Oaks segment a subway. With the East SFV Transit Corridor nearing EIR certification, that project segment will be Sylmar to Van Nuys Orange Line, the southern segment might be Sepulveda Pass alternative HRT 1 if chosen, if not, then the segment south of the Orange Line will have to be proposed as a new project (as an extension), going through the same process for its own EIR, which takes years. You need to include at least one track connecting the Purple Line to the Sepulveda Line, probably in Westwood. It’s important to be able to move trains between lines, when necessary. It would allow the lines to share a yard, and also be useful in emergencies. Longer term, I support connecting Sepulveda Phase 2 to Purple Phase 4 on the way to LAX. You have two “Centinela concepts” which could be combined to do just that. Basically, Sepulveda Phase 2 would continue to Expo/Sepulveda, and Purple Phase 4 would continue to Expo/Bundy. Then somewhere south of there they would join together. Now is the time to consider this, while the design of Purple Line Phase 3 in Westwood can still be modified, to include a breakout panel to allow a future connector tunnel. Why terminate the rail at 96th Street, continue it all the way to the new stadium complex and onto Vermont Ave to connect the proposed rail/brt along the Vermont Corridor. That way there is no struggle with the FAA over extending the LAX people mover. Steve, If Sepulveda line goes Van Nuys to LAX, are they going to have to build a subway yard somewhere, or will they figure out how to get the equipment back to the downtown yard?